The initial cellular events and interactions that occur following DNA immunization are likely to be key to determining the character and magnitude of the resulting immune response, and as such, a better understanding of these events could ultimately lead to the design of more effective pathogen-appropriate DNA vaccines. Therefore, we have used a variety of sensitive cell-based techniques to study the induction of adaptive immunity in vivo. We examined the efficacy of induction of Ag-specific CD4+ and CD8+ T cell responses in vivo by the adoptive transfer of fluorescently labeled Ag-specific TCR transgenic T cells and have demonstrated how such approaches can be used to study the effect of simple DNA construct manipulations on immunological priming. OVA-specific CD8+ and CD4+ T cells were activated and divided in vivo following immunization with DNA constructs that targeted OVA expression to different subcellular locations; however, the kinetics and degree of cell proliferation were dependent on the cellular location of the expressed protein. DNA vectors encoding cell-associated OVA resulted in greater CD8+ T cell division compared with other forms of OVA. In contrast, soluble secreted OVA targeted to the classical secretory pathway enhanced division of CD4+ T cells. Furthermore, the inclusion of mammalian introns to enhance protein expression increased the ability of poorly immunogenic forms of Ag to activate naive T cells, indicating that not only the location, but also the amount of Ag expression, is important for efficient T cell priming following DNA injection. The ultimate objective of rational vaccine design is the induction of pathogen-appropriate immunity. As such, successful vaccine intervention requires an understanding not only of the type of protective immunity required against a particular pathogen (for example, CTLs, complement fixing serum Abs, mucosal IgA), but also the cellular events that influence the character of this productive immunity. DNA vaccination has emerged in recent years as a promising alternative to more traditional vaccine strategies, and relies on Ag expression in tissues following i.m. or epidermal delivery of plasmids that carry mammalian expression cassettes. Although it has become clear in recent years that professional APCs are essential for priming naive T cells following DNA injection (either by direct priming following transfection or by cross-priming) (1, 2, 3, 4, 5, 6, 7), some of the other factors that contribute to efficient immunological priming are less certain. We are interested in elucidating some of these factors by studying the in vivo behavior of Ag-specific T cells and examining how simple DNA construct manipulations can alter these priming events. Many studies have shown that in general, DNA vaccines injected i.m. elicit strong CTL responses and humoral responses characterized by serum IgG2a (indicating a predominant Th1-type response) (8, 9, 10, 11, 12). These responses are typically elicited following multiple doses of plasmid DNA over an extended period (often many weeks), by which time the initial cellular interactions have already occurred. Altering this default response and changing the character and magnitude of the response is in theory relatively simple using a DNA immunization approach, and many studies have shown that immune responses can be manipulated by strategies including: 1) altering the cellular location of expressed Ag (13, 14, 15, 16); 2) coexpression of cytokines or chemokines (17, 18, 19); 3) targeting Ag to MHC class II- or I-processing pathways (20, 21, 22); and 4) inducing apoptosis in and promoting phagocytosis of transfected cells (23, 24) as well as many others. Ag form and load influence both the magnitude of initial Ag-specific T cell expansion and the size of the memory cell pool following clonal contraction (25, 26, 27, 28, 29). Hence, these Ag-related factors may be important considerations when designing DNA vaccines. Several studies have indicated that the subcellular location of plasmid-encoded Ag expression (i.e., the Ag form first seen by the APC) has both quantitative and qualitative effects on immune responses, and in some cases protective efficacy (13, 14, 15, 16). Some studies have demonstrated that differential Ag localization influences both CTL responses and serum Ab subtypes, suggesting the preferential induction and proliferation of different Th subsets (13, 14, 15, 16). However, the initial cellular events that determine these outcomes have not been elucidated. One of our objectives was to investigate whether Ag localization (i.e., form) influenced the ability of DNA vaccines to prime MHC class I- and II-restricted naive T cells. T and B cell priming events have in the past been difficult to study due to the low precursor frequency of Ag-specific naive cells. However, adoptive transfer of small numbers of traceable naive transgenic (Tg)3 lymphocytes of known peptide specificity into normal syngeneic recipients has allowed many workers to investigate lymphocyte priming following immunization with immunogenic and tolerogenic Ags (30, 31, 32, 33). We have applied these techniques for tracking T cells in vivo following immunization with DNA constructs expressing OVA in various cellular locations. We show that DNA-expressed cell-associated Ag primes CD8+ T cells more efficiently than expressed soluble Ag, while exogenous and membrane-associated Ag primes CD4+ T cells better than cytosolic OVA forms. Furthermore, we demonstrate that simple construct manipulation, such as inclusion of an intron to increase gene expression, also influences the efficiency of T cell priming. Thus, both subcellular localization and Ag load are crucial influences on T cell priming following DNA injection. Understanding precisely how construct manipulations such as these can influence the inductive mechanisms and the cellular interactions underlying them may enhance our ability to engineer DNA vaccines that induce rapid and pathogen-appropriate recall responses. BALB/c and C57BL/6 (B6) mice were purchased from Harlan Olac (Bichester, U.K.) and used between 6 and 12 wk of age. DO11.10 TCR Tg mice have been described previously (34, 35) and contain CD4+ T cells that express a TCR that recognizes the chicken OVA (cOVA) peptide from aa 323–339 complexed with MHC class II molecule I-Ad (detected by the clonotypic mAb KJ1-26; Ref. 35). OT-I CD8+ Tgs express a Vα2+ TCR that recognizes OVA257–264 complexed with H-2Kb (36). All animals were housed at the University of Glasgow Central Research Facility (Glasgow, U.K.), and all procedures performed according to U.K. Home Office regulations. BALB/c RAW264.7 macrophages (European Collection of Cell Cultures, Salisbury, U.K.) were cultured in DMEM supplemented with 10% FCS, 2 mM glutamine, 100 U/ml penicillin, and 10 μg/ml streptomycin. DO11-green fluorescent protein (GFP) hybridoma (37) was cultured in RPMI supplemented as above. DO11-GFP is a T cell hybridoma with the gene encoding GFP under the control of the NFAT promoter so that upon activation through the TCR the gfp gene is transcribed and activated cells become fluorescent. Activated cells can be detected by flow cytometry using the FITC channel (FL1). COS-7 monkey kidney fibroblasts (European Cell Culture Collection) were cultured as for RAW cells. All cultures were incubated at 37°C in 5% CO2. The eukaryotic expression vector pcDNA3.1 (Invitrogen, San Diego, CA) contains the human CMV virus Immediate/early promoter and enhancer, the bovine growth hormone polyadenylation signal, and neomycin and β-lactamase genes for selection in mammalian cells and Escherichia coli, respectively. cOVA cDNA was kindly provided by N. Glaichenhaus (Centre National de la Recherche Scientifique, Institut de Pharmacologie Moléculaire et Cellulaire, Valbonne, France), and the full-length native OVA was cloned in pcDNA3.1 to give plasmid expressing native OVA (pNatOVA). Fig. 1⇓A shows all constructs used in this study and the location of I-Ad MHC class II- and H-2Kb MHC class I-restricted epitopes, respectively. A plasmid designed for plasmid expressing cytosolic OVA (pCytOVA) expression was constructed by omitting the first five codons of the native OVA cDNA. An alternative cytosolic expression plasmid was constructed as described previously (13) in which the central SacI fragment (encoding aa 19–144) of the native OVA cDNA was deleted. Because native OVA has an atypical secretion sequence (38), we used a heterologous leader to direct OVA to the classical secretion pathway via the endoplasmic reticulum and Golgi. The plasmid pOVA-IFN-γ (T. S. Kim, Chonnam National University, Kwangju, South Korea) that contains the human Ig κ signal leader fused to OVA cDNA (17) was used as template to construct the plasmid expressing secreted OVA (pSecOVA) in pcDNA3.1. OVA expressed using this construct is secreted in mammalian cells (17). A plasmid expressing the transmembrane region of the human transferrin receptor (TfR) fused to aa 149–385 from native OVA (plasmid expressing transferrin-OVA fusion protein; pTfROVA) has been described previously (39, 40) and was kindly donated by M. Zenke (Max-Delbück-Center for Molecular Medicine, Berlin, Germany). This construct has been shown by others to target OVA expression to the surface of mammalian cells in vitro and in vivo (39, 41). The chimeric intron from pCI-neo (Promega, Madison, WI), which is composed of the 5′-donor site from the first intron of the human β-globin gene and the branch and 3′-acceptor site from the intron of an Ig H chain variable region was cloned at the 5′-end of the full-length OVA cDNA to give pCINatOVA. Plasmids were prepared for transfection and immunization using Qiagen Endotoxin Free Plasmid Maxi- and Mega-prep kits (Qiagen, Valencia, CA) according to the manufacturer’s instructions. A, OVA constructs used in this study allow Ag targeting to different subcellular locations. The locations of the I-Ad MHC class II-restricted and H-2Kb MHC class I-restricted T cell epitopes are shown. B, Expression of OVA constructs in transfected COS-7 fibroblasts. Cell lysates and culture supernatants were serially diluted and analyzed for OVA expression by dot immunoblot using OVA-specific rabbit serum. RAW cell macrophages were seeded at 2 × 105 cells/ml in 24-well plates, activated for 48 h before transfection by the addition of murine IFN-γ (R&D Systems, Minneapolis, MN) to a final concentration of 5 ng/ml, and cultured to 90% confluence at 37°C in 5% CO2. Transfection complexes were prepared using 15 μg/ml Lipofectamine reagent (Invitrogen) and 3 μg/ml endotoxin-free plasmid DNA in serum-free DMEM and allowed to form at room temperature for 30 min. Before the addition of complexes, monolayers were washed in serum-free DMEM. Macrophages were used 24 h following transfection in DO11-GFP presentation assays. COS-7 fibroblasts were transfected essentially as described for RAW macrophages. OVA protein was demonstrated in cell lysates and cell-free culture supernatants by PAGE and immunoblot using OVA-specific rabbit serum (Sigma-Aldrich, St. Louis, MO), followed by alkaline phosphatase-conjugated sheep anti-rabbit serum (Serotec, Oxford, U.K.) and 5-bromo-4-chloro-3-indolyl phosphate/nitroblue tetrazolium (Sigma-Aldrich) as the substrate. Serial dilutions (log2) of cell lysates and supernatants were spotted onto nitrocellulose membranes and probed with OVA-specific serum to compare OVA expression levels following transfection with different OVA constructs. A total of 2 × 105 DO11-GFP hybridoma cells were added to transfected RAW cell monolayers in 24-well plates 24 h posttransfection. Plates were centrifuged at 450 × g for 5 min to initiate cell contact and incubated for a further 24 h. Cells were collected for flow cytometry in PBS containing 1 mM EDTA, washed in FACS buffer (PBS, 2% FCS, 0.05% sodium azide), blocked in FcR blocking buffer (anti-CD16/32 hybridoma supernatant (clone 2.4G2), 10% mouse serum, 0.1% sodium azide), and stained with biotinylated KJ1-26 mAb (30) followed by PE-conjugated streptavidin (SA-PE; BD PharMingen, San Diego). The KJ1-26+ population was analyzed for GFP fluorescence by flow cytometry using the FL1. In adoptive transfer experiments, spleens and lymph nodes from DO11.10 or OT-I mice were collected and single-cell suspensions prepared as described previously (31, 32). Flow cytometry was used to determine the percentage of DO11.10 and OT-I Tg cells. DO11.10 cells were identified in donor mice using PE-conjugated anti-mouse CD4 (BD PharMingen) and biotin-KJ1-26 followed by FITC-conjugated streptavidin (SA-FITC; Vector Laboratories, Burlingame, CA). OT-I cells were identified with PE-conjugated anti-mouse CD8 (BD PharMingen) and biotinylated anti-Vα2 (BD PharMingen) and SA-FITC. Approximately 3 × 106 Tg cells in 0.2 ml were transferred i.v. via the tail vein into either BALB/c or B6-recipient mice, respectively, 1 day before immunization. CFSE (Molecular Probes, Eugene, OR) labeling of cells from DO11.10 and OT-I mice was performed as described previously (42). Briefly, spleen and lymph node cells were suspended in HBSS at 5 × 107 cells/ml and incubated in CFSE at a final concentration of 5 μM for 10 min at 37°C. Cells were then washed twice in HBSS, stained to determine the percentage of Tg cells, and resuspended in RPMI 1640 for adoptive transfer as described above. Mice were immunized in both tibialis anterior muscles (i.e., two sites) with 25 μg plasmid DNA diluted in endotoxin-free PBS in a 50-μl final volume 1 day after lymphocyte transfer and did not receive any further boost injections. Injections were done using a 27.5-gauge tuberculin syringe fitted with a plastic needle collar to adjust the injection depth to ∼2 mm. cOVA (100 μg; Fraction V; Sigma-Aldrich) emulsified in CFA, was administered s.c. in the scruff of the neck 1 day after cell transfer. In some experiments, mice were immunized with plasmid DNA as above without prior cell transfer. Blood was collected from the tail vein at various points postimmunization for analysis of serum Abs. In some experiments, mice were boosted (as above) 3 wk after priming, and draining lymph nodes and spleens were collected after a further 4 wk (day 50) for in vitro restimulation and cytokine analysis. Draining popliteal and inguinal lymph nodes were removed at various times after plasmid immunization. Single-cell suspensions were prepared and blocked in FcR blocking buffer. Clonal expansion was analyzed following staining with PE-anti-mouse CD4, biotin-KJ1-26, and SA-FITC for DO11.10 transfer experiments or PE-anti-mouse CD8, biotin-anti-Vα2, and SA-FITC for OT-I experiments. Three-color flow cytometry was used to demonstrate CFSE-labeled DO11.10 T cells by staining with PerCP-conjugated anti-mouse CD4, biotin-KJ1-26, and SA-PE. The CFSE fluorescence of 1000 CD4+KJ1-26+ events was measured using FL1. OT-I T cells were stained using PerCP-anti-mouse CD8, biotin-Vα2, and SA-PE and CFSE fluorescence analyzed as above on gated CD8+Vα2+ lymphocyte populations. Division markers were defined using cells from mice vaccinated with OVA in CFA. The early activation marker CD69 was demonstrated on OT-I cells using FITC-conjugated anti-CD69 and FITC-conjugated hamster IgG as an isotype control. The percentage of T cell blasts was determined by increased forward scattering of CD4+KJ1-26+ or CD8+Vα2+ cell populations. Draining lymph nodes and spleens were collected from mice at various times postimmunization. Single-cell suspensions were prepared in complete RPMI 1640 and ∼4 × 106 lymphoid cells from immunized mice were restimulated in vitro with 1 μM OVA257–264 peptide in 24-well plates. Culture supernatants were collected after 72 h and analyzed for IFN-γ production by capture ELISA. Lymphoid cells from popliteal and inguinal lymph nodes of OT-I-transferred plasmid-vaccinated mice were cultured for 4 h in vitro with 1 μM OVA257–264 peptide as described above, but in the presence of 10 μg/ml brefeldin A (Sigma-Aldrich). Following restimulation, cells were collected and the surface markers CD8 and Vα2 TCR were stained as described previously. Cells were fixed and permeabilized using PermaCyte-FP buffers (BioErgonomics, St. Paul, MN) according to the manufacturer’s instructions, and aliquots were incubated in PE-conjugated anti-IFN-γ or PE-conjugated rat IgG1 as isotype control (both BD PharMingen). Three-color flow cytometry was used to demonstrate IFN-γ staining in ∼2000 CD8+Vα2+-gated lymphocytes. ELISAs for OVA-specific serum IgG2a and IgG1 were performed essentially as described previously (32) using ο-phenylenediamine (Sigma-Aldrich) as substrate. ELISAs for quantification of IFN-γ in the supernatants of in vitro restimulated lymph node and splenic cell suspensions was done as described previously (32). Group means were represented ± SEM when groups contained three or more animals and as ± range when n = 2. Differences between groups were analyzed using Student’s two-tailed t test. OVA expression in transfected COS-7 fibroblasts was analyzed by dot immunoblot (Fig. 1⇑B) and PAGE/immunoblot (data not shown) of whole-cell lysates and cell-free culture supernatants using an OVA-specific rabbit serum. Fig. 1⇑B is a dot blot showing serial doubling dilutions of cell lysates normalized for total protein content and supernatants probed with OVA-specific serum. 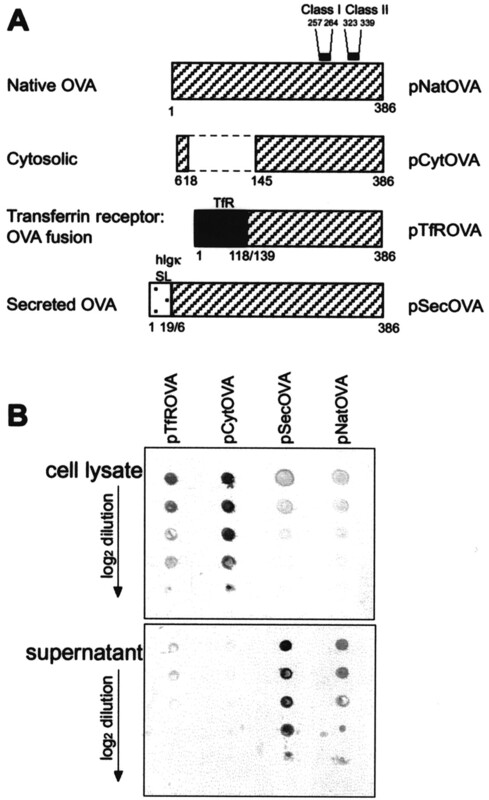 pTfROVA and pCytOVA transfectants produce a predominantly cell-associated OVA, whereas pSecOVA transfectants secrete the majority of the OVA protein. Although this is not a quantitative assay, it allows us to conclude that the amount of Ag expressed by the different constructs is at least comparable in vitro. Therefore, differential immune responses observed are likely to be due to the cellular location of the expressed protein rather than due to differences in Ag dose. 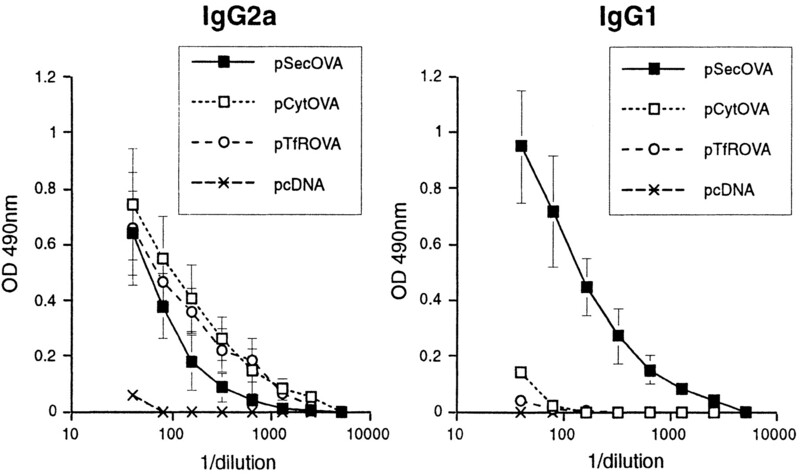 Vaccination with plasmids that targeted OVA expression to different cellular locations induced OVA-specific IgG2a 21 days after a single priming immunization (Fig. 2⇓). The plasmid pSecOVA induced more IgG1 than other OVA forms. Serum Abs were detected as early as 13 days after priming (data not shown), and subsequent plasmid boosts further increased the IgG2a and IgG1 levels (data not shown). These results suggest that the subcellular localization of OVA expression influences the magnitude and character of the humoral response and these are determined early in the developing immune response. OVA-specific serum IgG is elicited following i.m. DNA injection with all OVA constructs. BALB/c mice were given a single i.m. injection, blood was collected at day 21, and serum was analyzed for OVA-specific IgG2a and IgG1 (n = 4). Ab dilution curves (represented as group mean OD490 ± SEM against serum dilution) show that subcellular location influences the magnitude and character of the resulting humoral response. As we had some preliminary indication that vaccination with our OVA constructs induced an immune response, we next attempted to define some of the underlying cellular events in vivo. As activation of naive T cells in vivo is difficult to detect due to the low precursor frequency of Ag-specific cells, we have used adoptive transfer of TCR Tg T cells into normal recipients to study T cell priming following vaccination with different OVA DNA constructs. We first examined CD8+ T cell responses which DNA vaccines have been reported to prime efficiently (8, 9, 10, 11, 12). Enumeration of OVA-specific Tg CD8+Vα2+ T cells in the draining lymph nodes of DNA-immunized mice indicated no significant clonal expansion over a 12-day period (Fig. 3⇓A), whereas animals immunized with OVA in CFA showed a significant response with a peak clonal expansion at day 6 postimmunization. However, in most experiments, individual lymph nodes showed both an increased proportion and increased total number of Tg cells although group means were not statistically significant when compared with pcDNA (vector-only) controls. Although the proportion of Tg T cells was not always increased, we demonstrated increased numbers of CD8+Vα2+ T cell blasts in the draining popliteal lymph nodes of mice 6 days after injection with plasmids encoding cell-associated and secreted OVA forms (Fig. 3⇓C). Blastogenesis was accompanied by the up-regulation of the early T cell activation marker CD69 (Fig. 3⇓B), thus indicating that transferred cells were indeed primed following DNA immunization. Therefore, although Ag-specific CD8 T cells are activated following i.m. DNA injection, the proportion of Tg CD8 T cells in the draining lymph nodes, relative to the total number of lymphocytes, does not increase dramatically, as is seen following protein vaccination. As was the case following CD8+ OT-I transfer, we could not demonstrate significant clonal expansion following CD4+KJ1-26+ TCR Tg T cell transfer, although individual animals showed both an increased proportion of Tg cells and blastogenesis within the CD4+KJ1-26+ population in draining lymph nodes (data not shown). Thus, the peak in clonal expansion seen for CD4 and CD8 T cells following immunization with protein in adjuvant is not observed following i.m. DNA vaccination. CD8+ OT-I T cells up-regulate markers of T cell activation; however, the proportion of Tg cells in draining lymph nodes does not significantly increase. A, Kinetics of clonal expansion of OT-I T cells following i.m. vaccination with pSecOVA, pCytOVA, and pcDNA and OVA in CFA immunized s.c. Popliteal and inguinal lymph nodes were harvested at 4, 6, and 11 days postvaccination and the percentage of CD8+Vα2+T cells was determined by flow cytometry, and n = 2 for each time point. Results for popliteal lymph nodes are shown. B, Percentage of CD69+CD8+Vα2+ T cells in popliteal lymph nodes of DNA vaccinated mice 6 days postvaccination. C, Percentage of CD8+Vα2+ T cell blasts in popliteal lymph nodes 6 days post DNA vaccination. Data are presented as group means ± range (n = 2) and is representative of two independent experiments. As we saw little evidence of CD4+ or CD8+ T cell clonal expansion, we wanted to determine whether plasmid-expressed OVA was being processed to produce the appropriate peptides for DO11.10 activation. IFN-γ-activated macrophages transfected with pTfROVA (Fig. 4⇓B), pSecOVA (Fig. 4⇓C), and all other constructs tested (data not shown) presented OVA323–339 peptide to DO11-GFP hybridoma cells. In these experiments, ∼29% of DO11-GFP cells showed increased GFP fluorescence intensity when pSecOVA-transfected macrophages were used as stimulator cells. All other plasmids including pTfROVA (Fig. 4⇓B, 15%) showed less activation (data not shown). Therefore, we were confident that OVA expressed from all constructs could be processed appropriately to activate DO11.10 T cells. In vitro-transfected RAW264.7 macrophages present OVA peptide to DO11-GFP hybridoma. IFN-γ-activated macrophages were transfected with plasmids including pcDNA (empty vector; A), pTfROVA (B), and pSecOVA (C), and cocultured with DO11-GFP hydridoma cells. Fluorescence of KJ1-26+ cells was measured by flow cytometry using the FL1. The percentage of KJ1-26+GFP+ cells is indicated by markers. pCytOVA and pNatOVA showed similar percentage of KJ1-26+GFP+ cells as pTfROVA. These data are representative of two separate transfection experiments. Whereas there was no obvious increase in the total proportion of CD8+ or CD4+ Tg T cells, CFSE-labeling before adoptive transfer indicated significant T cell activation and division in vivo. CFSE segregates equally between daughter cells upon division resulting in sequential halving of fluorescence intensity with each generation (42). This technique has allowed us to follow the proliferative history of individual cells following vaccination with different DNA constructs. Recipient B6 mice have an endogenous population (2.5–3%) of CD8+Vα2+ lymphocytes that have a CFSElow phenotype as shown in Fig. 5⇓A. Labeled undivided cells are characterized by CFSEhigh staining, as can be seen following i.m. immunization with the empty vector pcDNA where the majority of labeled cells remain undivided. In contrast, vaccination with OVA-expressing plasmids, including pTfROVA that encodes a cell-associated form of OVA, results in substantial cell division in the draining inguinal lymph node. Each of the peaks between the undivided and endogenous populations represents one division of cell cycle-synchronized cells. The division numbers were assigned using the clearly defined peaks for the OVA/CFA s.c. control (inguinal nodes) and the number of cells falling within each of these division numbers was calculated for individual mice in each group. After four divisions, CFSElow Tg cells are obscured within the endogenous population; thus, results may actually be an underestimate of the number of primed/dividing cells. There was also evidence of cell division as early as 4 days postvaccination (data not shown). CD8+ T cell division in vivo following vaccination with OVA-expressing plasmids. OT-I lymphocytes were labeled with CFSE and adoptively transferred into B6 recipients. Eight days after i.m. DNA vaccination, draining lymph nodes were harvested and analyzed by flow cytometry. A, Cells were gated on CD8+Vα2+ lymphocytes and the endogenous CD8+Vα2+ CFSElow population in B6 recipients is indicated. 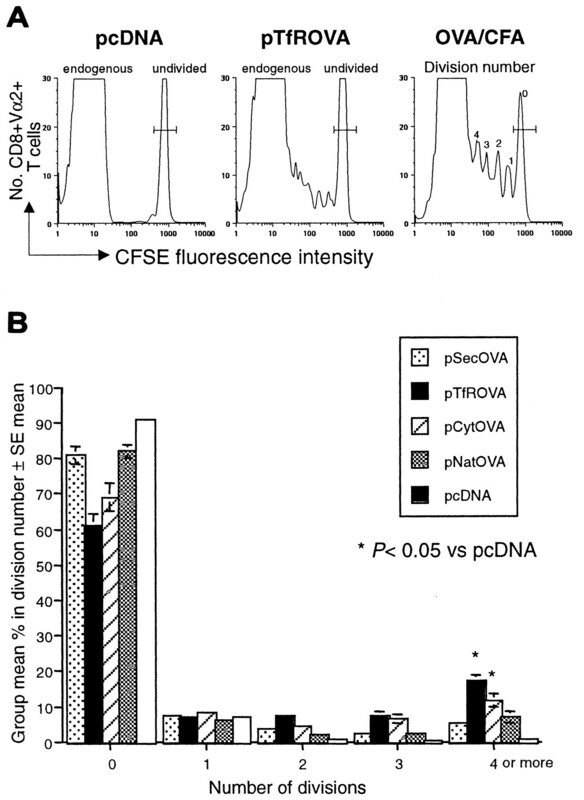 Cells remain undivided (CFSEhigh) following vaccination with pcDNA (empty vector), whereas vaccination with pTfROVA resulted in substantial cell division, as indicated by the decrease in CFSE fluorescence intensity with each successive cell division. Division boundaries were defined based on OVA + CFA s.c. cell division and division numbers were assigned to each peak. Examples from inguinal lymph nodes are shown. B, Division analysis in popliteal lymph nodes following injection with plasmids that target OVA expression to different subcellular compartments. 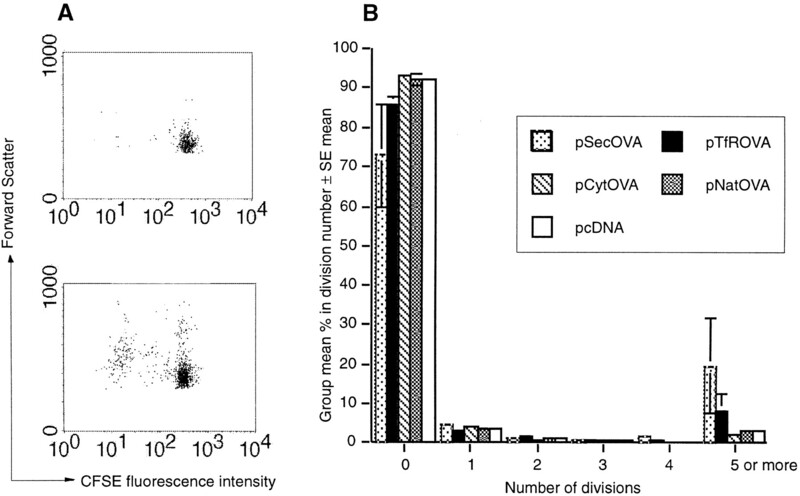 Results show the group mean (±SEM; n = 3) percentage of cells that have undergone 0, 1, 2, 3, or 4 or more divisions following vaccination with pSecOVA, pTfROVA, pCytOVA, pNatOVA, or pcDNA. Data are representative of three independent experiments, and p values from Student’s t test comparing OVA plasmids to empty vector pcDNA are indicated. Division analysis following vaccination with OVA constructs that target expression to different subcellular compartments revealed variability in the kinetics and magnitude of CD8+ T cell division in vivo. Following pTfROVA vaccination, Tg cells in both the popliteal and inguinal (data not shown) lymph nodes divided earlier and underwent more divisions by 8 days postvaccination than those in mice immunized with other plasmids. Eight days after pTfROVA immunization, for example, 13.9 ± 2.2% (group mean ± SEM; n = 3) of OT-I cells in the popliteal lymph node had divided four or more times, whereas following pSecOVA injection only 4.2 ± 0.5% of cells had divided to the same extent. Vaccination with pSecOVA resulted in delayed and significantly (p < 0.05) less division than vaccination with plasmids encoding cell-associated OVA (pCytOVA and pTfROVA) in both the popliteal lymph node (close to the site of vaccination) and the more distal inguinal node (data not shown). There was also more evidence of blastogenesis (the prelude to cell division) of OT-I T cells in both the popliteal and inguinal nodes at day 8 post pSecOVA vaccination, whereas OT-I T cells had already blasted and divided several days earlier following pCytOVA or pTfROVA vaccination (data not shown). This further supports the conclusion that priming by pSecOVA was delayed. These results highlight the superior ability of cell-associated forms of Ag to activate and induce proliferation of CD8+ T cells in vivo. As was the case following transfer of CD8+ OT-I lymphocytes, there was no significant clonal expansion following adoptive transfer of CD4+ DO11.10 T cells and subsequent i.m. DNA immunization (data not shown). However, CFSE staining revealed that both pTfROVA (Fig. 6⇓) and pSecOVA (Fig. 6⇓B) vaccination induced the division of transferred DO11.10 cells in the draining popliteal lymph nodes. Eight days after pTfROVA vaccination, there was an increase in the number of CFSElow cells in comparison to the number following pcDNA vaccination (Fig. 6⇓A). We also observed increased forward scatter in CD4+DO11.10 T cells from pTfROVA-vaccinated mice (Fig. 6⇓A), indicating T cell blastogenesis in these lymph nodes. In comparison to the OT-I studies, fewer DO11.10 cells divided overall; although those that did divide proceeded through at least five divisions by 8 days postvaccination. Approximately 19.3 ± 11.9% (group mean ± SEM; n = 3) and 8.2 ± 3.9% of DO11.10 T cells in the popliteal nodes had divided five or more times following pSecOVA and pTfROVA injection, respectively. In comparison, <3% of Tg cells had divided to the same extent following vaccination with plasmid encoding other OVA forms. Cell division was usually limited to the popliteal lymph nodes, although later time points revealed some dissemination of the proliferative response to the more distal inguinal lymph nodes (data not shown). CD4+ T cell division in vivo following vaccination with OVA-expressing plasmids. DO11.10 lymphocytes were labeled with CFSE and adoptively transferred into BALB/c mice. Draining inguinal and popliteal lymph nodes were harvested and analyzed by flow cytometry. CD4+KJ1-26+ cells were analyzed for CFSE fluorescence. Undivided cells remain CFSEhigh, whereas cells that have divided lose CFSE fluorescence intensity. A, Following vaccination with pcDNA (empty vector) only a few cells in this popliteal lymph node have CFSElow phenotype, whereas following vaccination with pTfROVA many cells have undergone division. B, Division analysis in popliteal lymph node following injection with subcellular targeting plasmids. Results show the group mean percentage ± SEM (n = 3) of cells that have undergone 0, 1, 2, 3, 4, or 5 or more divisions 8 days after vaccination with pSecOVA, pTfROVA, pCytOVA, pNatOVA, or pcDNA. Markers were defined based on OVA + CFA cell division. Data are representative of three independent experiments. The inclusion of introns in mammalian expression vectors is known to increase gene expression, and hence, protein production both in vitro and in vivo (43). Because Ag load influences the magnitude of the initial T cell clonal burst, and hence, the size of the effector and memory cell populations, we wanted to know if plasmid manipulations that increase the amount of Ag, such as including an intron, also influence T cell priming following DNA vaccination. Hence, we constructed OVA-expressing constructs with and without a chimeric intron. Lymphoid cells from conventional B6 mice immunized (×2) with the intron-containing construct pCI-NatOVA produced 2-fold more IFN-γ than did the intronless pNatOVA, following in vitro restimulation with the H-2Kb-associated class I-restricted OVA257–264 peptide (Fig. 7⇓A). This assay measures the ability of peptide-specific memory CD8+ T cells to respond to Ag challenge. The higher IFN-γ levels from the intron-containing group suggest a quantitative difference in the size of the day 50 memory pool between the groups with or without an intron. The inclusion of mammalian introns in plasmid constructs influences the developing CD8+ T cell response following DNA injection. A, Lymphoid cells taken at day 50 from normal untransferred mice that had received two doses of the intron-containing plasmid pCI-NatOVA produced twice as much IFN-γ following in vitro OVA257–264 restimulation as pNatOVA. B and C, CFSE-labeled OT-I T cells were adoptively transferred into B6 recipients and flow cytometry was used to assess in vivo cell division in popliteal and inguinal lymph nodes 8 days after i.m. injection of pcDNA, pNatOVA, or pCI-NatOVA. Markers were defined based on OVA + CFA s.c. cell division. C, The group mean percentage of CD8+Vα2+ cells ± SEM (n = 3) that have proceeded through 0, 1, 2, 3, or 4 or more divisions. ∗, p < 0.05 when compared with pcDNA (vector-only) group using the Student’s t test, whereas ∗∗, p < 0.05 for pNatOVA vs pCI-NatOVA. Only data for popliteal lymph nodes are shown. Data are representative of three independent experiments. D, Lymphoid cells taken at day 7 from mice that had received unlabeled OT-I T cells and were vaccinated with pcDNA, pNatOVA, or pCI-NatOVA as described previously were restimulated in vitro with OVA257–264 peptide (+ brefeldin) and stained for intracellular IFN-γ. Representative dot plots from each group show CD8+Vα2+ T cells that are also IFN-γ+. These differences in eventual outcome (i.e., differential IFN-γ production upon in vitro restimulation at day 50 postpriming) may be explained by variability in the efficiency of CD8 T cell priming by the two constructs. To investigate this further, we studied T cell priming using vaccinated mice previously transferred with CFSE-labeled OT-I T cells. CD8+ T cells divided significantly more times following vaccination with the intron-containing plasmid pCI-NatOVA than after pcDNA (empty vector) injection (Fig. 7⇑, B and C). 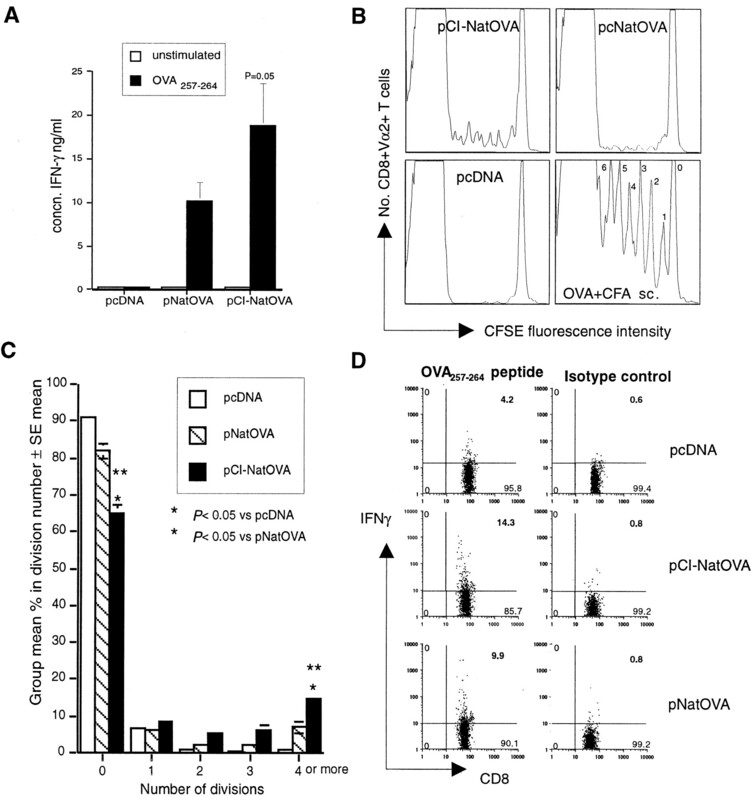 Furthermore, the addition of an intron at the 5′-end of the OVA cDNA significantly enhanced the proliferative response following pNatOVA injection (p < 0.05). Eight days after pCI-NatOVA vaccination, 14.9 ± 0.6% (group mean ± SEM; n = 3) of OT-I T cells in the popliteal lymph nodes had divided four or more times in contrast to 7.0 ± 1.7% of cells from pNatOVA-vaccinated mice. Seven days after OT-I cell transfer and vaccination with pCI-NatOVA and pNatOVA, the number of IFN-γ producing CD8+ Tg T cells in draining lymph nodes following brief peptide restimulation in vitro was higher for the intron-containing group (Fig. 7⇑D). This assay measures primary and rapid recall responses, and the data suggest that even at this early time point, there are measurable differences between groups, not only in cell division but also in terms of effector molecules, i.e., cytokines. Based on these results, we can conclude that the efficiency of T cell priming is enhanced by the inclusion of a mammalian intron in the construct design. The initiation of an immune response is influenced by the dose and form of administered Ag, its ability to access Ag-processing pathways, and the costimulation and cytokine environment at the time of Ag uptake and presentation. All these factors combine to influence the initial clonal burst, survival, and differentiation (e.g., Th1, Th2, CTL) of T cells (25, 26, 27, 28). Until recently, we have been unable to study these events in detail, being limited to measuring the outcome of these cellular interactions weeks after initial Ag stimulation. Using a sensitive cell-based approach involving the adoptive transfer of TCR Tg CD4+ and CD8+ T cells, we have found that relatively simple manipulations of a DNA vaccine construct can have profound effects upon T cell priming. We have demonstrated that both Ag form and load influence the priming and proliferation of naive T cells in the first days following i.m. DNA administration. Furthermore, the optimal cellular location for priming CD4+ and CD8+ T cells differed. Secreted Ag was more efficacious for inducing proliferation of CD4+ T cells, whereas cell-associated Ag primed CD8+ T cells more efficiently than secreted Ag forms. These results suggest that Ag dose and localization will be crucial factors influencing the immune response to DNA vaccination. i.m. injection of constructs encoding cell-associated forms of OVA (pTfROVA and pCytOVA) induced greater and more rapid CD8+ T cell division in the draining lymph nodes than when secreted OVA constructs were injected. Cell-associated forms of OVA induced CD8+ T cell division within 4 days and many cells (e.g., ∼40% for pTfROVA; Fig. 5⇑B) had divided by 8 days postvaccination. Secreted Ag including OVA targeted to either the classical secretory pathway (pSecOVA) or secreted via a nonclassical mechanism (pNatOVA) was also capable of priming CD8+ T cells. However, in both of these cases, <20% of cells had undergone one or more divisions by 8 days after vaccination (Fig. 5⇑B). Furthermore, following vaccination with pSecOVA, the initiation of the response was somewhat delayed in comparison to that for cell-associated forms. We were also able to detect cell division following vaccination with cell-associated forms at sites more distal to the site of injection (i.e., the inguinal lymph nodes) when the response to pSecOVA was restricted to the local popliteal lymph nodes. These results suggest that cell-associated OVA induces a more rapid and disseminated response and indicated that although CD8+ T cells can divide in response to DNA vaccination with constructs encoding soluble Ag, cell-associated forms greatly enhance the speed and magnitude of this type of response. Any discussion of mechanisms by which these different OVA forms are processed for presentation to MHC class I-restricted CD8+ T cells is complicated by the fact that both nonpresenting muscle cells and APCs may be transfected by injected DNA and both may express Ag. If APCs take up the plasmid directly and express and process Ag, then cytosolic Ag can readily access the MHC class I presentation pathway, whereas Ag targeted to the classical secretory pathway is perhaps less efficient at accessing this pathway. However, there is increasing evidence that direct transfection of bone marrow-derived APCs (such as dendritic cells (DCs)) may be less important, but rather the major role of the APC is in presenting Ag (or peptide) produced by transfected myocytes to naive T cells (cross-priming). Recent studies have shown that cross-priming is also a major mechanism for priming CD8+ T cells following transdermal gene gun immunization (7). Although our study was not designed to follow the fate of Ag targeted to different subcellular locations, it would be interesting to identify where precisely immunologically relevant peptide was being generated in vivo for each of these constructs. MHC class I-associated peptide on the surface of muscle cells may be directly transferred to DCs, or chaperone:peptide complexes may be taken up by a receptor-mediated mechanism (6). APCs may acquire Ag (or peptide) by phagocytosis of apoptotic or necrotic muscle cells, and secreted protein may enter APCs by micropinocytosis, be processed, and presented. Studies of CD8 T cell cross-priming using OT-I T cells have shown that cell-associated OVA (OVA-coated splenocytes) is presented much more efficiently than soluble OVA, with 50,000-fold more soluble Ag required to stimulate equivalent cell proliferation (25). Our data suggest that although soluble exogenous Ag (secreted OVA) can access the MHC class I-processing pathway, this is less efficiently presented (cross-presented) to CD8 T cells than cell-associated forms. We next examined the ability of OVA constructs to induce CD4+ T cell responses. All forms of OVA could be processed by macrophages and presented to DO11.10-GFP T cell hybridomas in in vitro presentation assays. In these assays, macrophages transfected with constructs designed to secrete OVA were best for activating the DO11.10-GFP hybridoma, thus exogenous Ag may enter the MHC class II-processing pathway more efficiently than other Ag forms. Studies by others have also demonstrated the differing abilities of OVA targeted to different cellular locations of transfected DCs to stimulate proliferation of CD4+ DO11.10 T cells (40). In these experiments, OVA targeted to the cell surface using the same TfR fusion construct used in our experiments, or as a fusion with murine invariant chain stimulated proliferation of T cells, whereas cytosolic Ag expression was ineffectual. Based on our in vitro results, we were confident that plasmid-encoded OVA could be processed and presented to CD4+ DO11.10 T cells, at least in vitro. In our in vivo studies, secreted and surface/membrane-bound forms of OVA were efficient at stimulating the proliferation of adoptively transferred DO11.10 T cells, suggesting that the optimal way to prime CD4+ T cells is to target Ag for secretion or membrane association. In some mice, ∼56% of DO11.10 T cells had divided, although the group mean was significantly lower (Fig. 6⇑B). Exogenous protein is known to efficiently enter the MHC class II-processing pathway after being taken up by APCs, processed and Ag-derived peptide presented with MHC class II molecules. The fact that pTfROVA was efficient for priming DO11.10 T cells is somewhat surprising, particularly if it is assumed that myocytes are the predominant cell type transfected and expressing the Ag. If professional APCs such as DCs are directly transfected, the TfR component should direct the TfROVA fusion proteins to the cell surface and recycling vesicles, which may then intersect with endosomes/lysosomes where intact fusion protein may be proteolytically degraded for loading on MHC class II molecules. In contrast, cytosolic Ag expression was inefficient at inducing division of DO11.10 T cells, at least at the time points examined in this study. Although endogenous Ags can be presented with MHC class II, the mechanism by which cytosolic Ag in myocytes is acquired by APCs and presented with MHC class II is unclear but may involve phagocytosis of cellular material, which then enters the MHC class II-processing pathway. Although we have not shown in this study that vaccination using secretion and surface association constructs is better at providing help to B cells for Ab synthesis, we are interested to extrapolate the finding that these constructs are better for initial T cell proliferation to whether these also are superior for enhancing T cell differentiation and cytokine production and for helping B cells (i.e., effector function). If this is the case, then an explanation for secreted Ag vectors inducing higher Ab titers (13, 14, 15) may not only be by increasing the availability of Ag in the lymph node for priming B cells, but also by increasing the activation, proliferation, and differentiation of Th cells. Others have shown significant clonal expansion of DO11.10 T cells following gene gun immunization of OVA-expressing plasmids (33). In contrast, we were unable to demonstrate significant and reproducible increases in the total percentage of DO11.10 cells in the draining lymph nodes, although we could identify individual mice that had elevated numbers of Tg T cells. i.m. plasmid injection results in the production of small amounts of Ag (typically picogram-low nanogram/muscle; Ref. 44 and data not shown), and this may explain the absence of a significant rapid increase in the number of CD4+ (or CD8+) T cells. Immunogenic and tolerogenic forms of protein Ag both induce significant DO11.10 clonal expansion within 5 days as measured by the percentage of Tg cells (30, 32). Decreasing the amount of Ag has been shown to decrease clonal burst size, although the use of more sensitive techniques such as CFSE labeling has demonstrated that even with a very low amount of Ag, cells still divide and differentiate to effector and memory phenotypes (26). Following protein immunization there is an initial clonal burst, influenced by cell recruitment and cell division, after which many cells die while others progress through the cell cycle and differentiate into effectors or memory cells. Thus, the resulting pool of memory and effector cells after immunization is directly related to the initial clonal burst size. i.m. DNA vaccination, due to the small amounts of Ag and the continued Ag expression, does not appear to result in a single rapid clonal burst, but rather delayed and sustained T cell division. Recent data indicate that CD8+ and CD4+ T cells are fundamentally different in their requirements for activation and clonal expansion (45). Recent studies have suggested that CD8+ T cell proliferation requires less Ag for activation and is not influenced by the duration of Ag presentation. Upon activation, these cells enter a developmental program that instructs them to continue division and differentiation into effectors and memory cells in the absence of further Ag stimulation (26, 27, 28, 45). It is hypothesized that this is an adaptation for situations, for example, at initial stages of virus infection when very low amounts of Ag are present. This may partially explain why DNA vaccines are particularly good at inducing CTLs. In contrast, CD4+ Th1 cells appear to require repeated Ag exposure and increased amounts of Ag for the survival of proliferating cells and for differentiation into cytokine-producing effector cells, although not for initial proliferation (28). In our study, CD4+ DO11.10 T cells only divided following injection of constructs expressing soluble and membrane-associated Ag, and in contrast to the OT-I studies, relatively fewer cells divided. This may be related to insufficient quantities of Ag to stimulate extensive CD4+ T cell division, at least at the time points examined, although different sensitivities of the different T cell clones may also explain this observation. Therefore, theoretically, increasing Ag amount should determine whether or not CD8+ T cells differentiate into CTLs/memory cells, but may increase the absolute number of dividing cells and subsequently effectors and memory cells. To evaluate the influence of Ag amount on the efficiency of T cell priming following DNA immunization, we constructed vectors that incorporated elements for altering the level of Ag expression. The inclusion of an intron in the expression constructs (which is known to increase gene expression and thus the total amount of Ag; Ref. 43) indicated that higher Ag doses increased the number of OT-I cells undergoing division. Following pNatOVA injection, ∼18% of OT-I T cells in the popliteal lymph nodes had divided one or more times (i.e., 82 ± 2, 2% remained undivided; Fig. 7⇑C), whereas the inclusion of a chimeric intron preceding the NatOVA cDNA (pCI-NatOVA) increased the number of cells that had divided to ∼35% (i.e., 65.1 ± 2.1% undivided). This result demonstrated that increasing the amount of a poorly immunogenic Ag increases CD8+ T cell division, which may compensate for the location of Ag expression. In addition to its effect on CD8+ T cell division, we were also able to demonstrate increased numbers of Ag-specific IFN-γ+ CD8 T cells in the first days after vaccination. Additional studies are needed to further characterize the influence of introns (and hence Ag load) on the resulting memory and effector populations generated by DNA immunization. We have demonstrated that the location and level of plasmid-encoded Ag expression influence the efficiency of both CD4+ and CD8+ T cell priming, and that simple construct manipulations influence the initiation of the immune response. Using sensitive techniques such as adoptive transfer of Tg lymphocytes, we have identified some key factors that influence the developing immune response following DNA injection. The exploitation of these new technologies may allow us to understand many of the key inductive mechanisms related to lymphocyte priming, cell interactions, cell trafficking, and the longevity of the immune response following DNA vaccination at the level of the individual cell. This may ultimately allow us to produce “designer” DNA vaccines that have been engineered to produce the most relevant type and magnitude of response at the most appropriate location for a particular pathogen. We thank David Underhill for supplying the DO11.10-GFP hybridoma, and Martin Zenke for plasmids. ↵1 This work was supported by a grant from the Wellcome Trust (to P.G. and T.M.). ↵3 Abbreviations used in this paper: Tg, transgenic; cOVA, chicken OVA; DC, dendritic cell; GFP, green fluorescent protein; SA-FITC, FITC-conjugated streptavidin; TfR, transferrin receptor; FL1, FITC channel; pCytOVA, plasmid expressing partial cytosolic OVA; pNatOVA, plasmid expressing native OVA; pSecOVA, plasmid expressing secreted OVA; pTfrOVA, plasmid expressing transferrin-OVA fusion protein; SA-PE, PE-conjugated streptavidin.